US Hybrid, a manufacturer of battery and fuel cell propulsion systems, has joined Toyota and Kenworth in a growing effort to show that hydrogen fuel-cell electric trucks can successfully compete with diesels in the port drayage business. All three companies have announced plans to deploy fuel cell Class 8 drayage trucks to move containers at the Ports of Los Angeles and Long Beach this year. 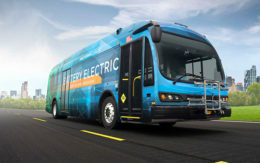 US Hybrid, which developed its own system – as did Toyota – said its tractor, based on a Navistar International ProStar day cab, will use US Hybrids’ FCe 80 “fuel cell engine.” The fuel cell can send 80 kiloWatts of peak power to a 500-horsepower electric motor, via a 30-kiloWatt-hour lithium-ion battery pack. The motor is capable of delivering up to 2,900 lb-ft of torque. The system will provide up to 200 miles of range from 25 kilograms of compressed hydrogen – the energy equivalent of 22 gallons of low-sulfur diesel fuel. Refueling with compressed hydrogen gas will take less than 9 minutes, the company said in an announcement earlier this week at the Advanced Clean Transportation Expo in Long Beach, Calif.
A fuel cell system uses compressed hydrogen and oxygen to produce electricity, which can be stored in a large battery array or sent directly to an electric motor. Because the only tailpipe emission is a stream of distilled water, fuel-cell systems are being looked at as a way to provide the zero-emissions trucking that air quality regulators in California increasingly demand without the loss of service time required for recharging battery-dependent electric vehicles. Kenworth also said this week that said it will deploy a Class 8 fuel cell drayage truck using a Kenworth T680 chassis. It developed the rig in partnership with several component makers under a federal Department of Energy program. Toyota’s hydrogen-powered Class 8 drayage truck was unveiled late last month. It developed the truck on its own, using a fuel cell system derived from the company’s Mirai passenger car and mounting it in a Kenworth T680 tractor. US Hybrid, which previously has built battery-electric, fuel-cell electric and hybrid drive systems for commercial vehicles and transit buses, wants to become a major supplier of fuel cell systems for medium- and heavy-duty commercial trucks. The Torrance, Calif., company said this week that it has established a joint venture to build fuel cell systems at its Connecticut facility in partnership with Chinese polymers manufacturer Jiangsu Dewei Advanced Materials Co. US Hybrid said it expects to be able to supply 2,000 fuel cells per month to customers in the U.S. and the same number to customers in China once the Connecticut facility is expanded. At present capabilities, it is expecting to build and deliver 1,200 of its fuel cell “engines” over the next 36 months. Dewei develops and supplies polymer materials for electronic cables for the automotive, trucking, aerospace, marine and commercial appliances markets and is a supplier to General Motors, Volkswagen and Toyota.